The use of sponsored content in marketing campaigns — or paid advertising that resembles news items in print or broadcast outlets, or in the digital display market — has exploded in the last several years. According to a new report released by the USC Annenberg Center for Public Relations, however, the rising prevalence of sponsored content has since given pause to at least some marketing pros for the potential ethical implications this practice carries. The USC Annenberg survey found that nearly three-quarters of communications professionals polled — 74.5 percent — said they currently rely on branded content in their campaigns, with a majority — 57 percent — describing the practice as a “somewhat effective” strategy and another 24 percent citing it as “very effective.” More than two-thirds — 67 percent — said they expect to see their clients spend more on branded content within the next year. The prevalence of sponsored content has especially increased online in recent years, where content supplied by marketers that takes the appearance of journalism regularly appears in news feeds. Some websites today are funded almost exclusively by this native content. An April report by eMarketer found that sponsored content will account for nearly 60 percent of all digital display ad spending in the U.S. this year, or nearly $33 billion in total ad dollar spends. But not all native ads are required to carry these disclosures, and several reports published since the updated policy’s release have found that many native ads don’t comply with the FTC’s updated guidelines. Indeed, nearly half of respondents in the USC Annenberg study — 48.5 percent — admitted that it’s currently somewhat difficult or very difficult for consumers today to distinguish between sponsored and editorial content. Only about 15 percent of PR pros said they have ethical concerns regarding the industry’s use of sponsored content. Of those who admitted having some ethical concerns for the practice, 69 percent cited the potential to mislead consumers, while 50 percent said it undermines the media’s credibility and 47 percent said it comes at a cost to influencers’ authenticity. However, a clear majority of all respondents — 83 percent — think branded content should always be explicitly labeled, and nearly two-thirds — 62 percent — believe consumers should be able to block branded content on online platforms if they wish to do so. Finally, nearly half of PR pros — 47 percent — indicated that some groups or industries shouldn’t be allowed to rely on branded content strategies at all, including tobacco companies, hate groups, political organizations, alcohol makers and firearms manufacturers. The findings appear in an essay titled “What Is Branded Content and Is It Ethical?” which was authored by Ulrike Gretzel, PhD, a USC visiting fellow; and Taryn Maister, a recent USC Annenberg graduate. It was based on a 2018 survey of 220 PR professionals working at agencies, private companies, nonprofits and consultancies. 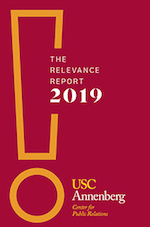 Full research findings are published in the USC Annenberg Center for Public Relations’ annual “Relevance Report,” which features essays covering trends in media, communication, technology, marketing and the PR industry.